If an escape to a quiet rustic lodge set high in the alpine meadows surrounded by gushing creeks, amazing waterfalls and spectacular views is the type of getaway you are looking for, then look no further. 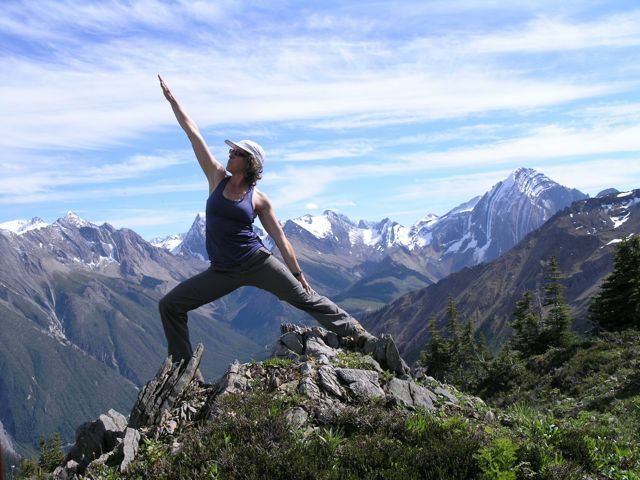 Icefall Lodge is your perfect mountain retreat, and fitness minded types will enjoy the leg work it takes to get there! 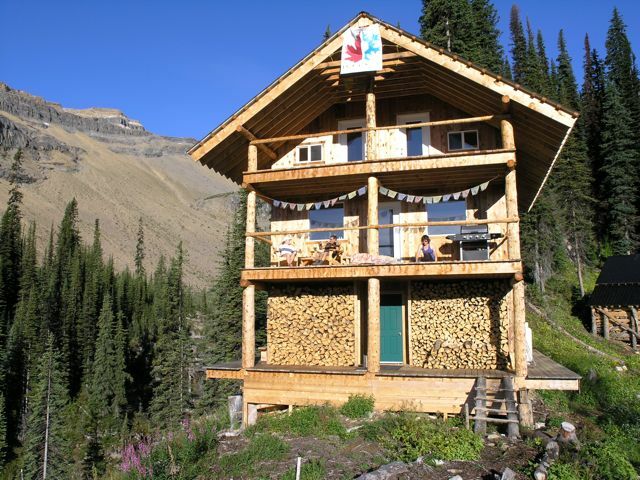 Icefall lodge is a rustic heli-skiing lodge nestled at the tree line high in the Rocky Mountains of British Columbia with helicopter or hike-in access only. I spent 3 days there this Fall with friends and family and wish there were words to describe what a spectacular trip this was. Hopefully my pictures do this amazing place some justice! 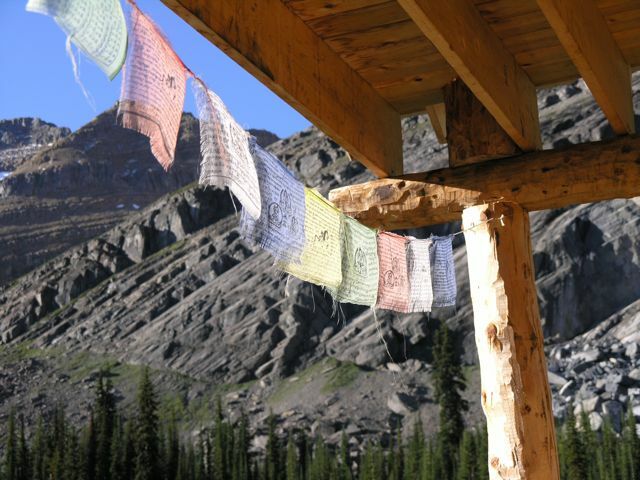 At 6300 feet, Icefall lodge is accessed by helicopter or by hiking in only. Even the trailhead itself is far enough from civilization to be considered back country. Over an hour and a half into the bush from the Trans Canada Highway, the last 22 kilometers of road to access the trailhead is decommissioned (ie: not maintained) and washouts are to be expected (bring your 4×4 and a shovel). 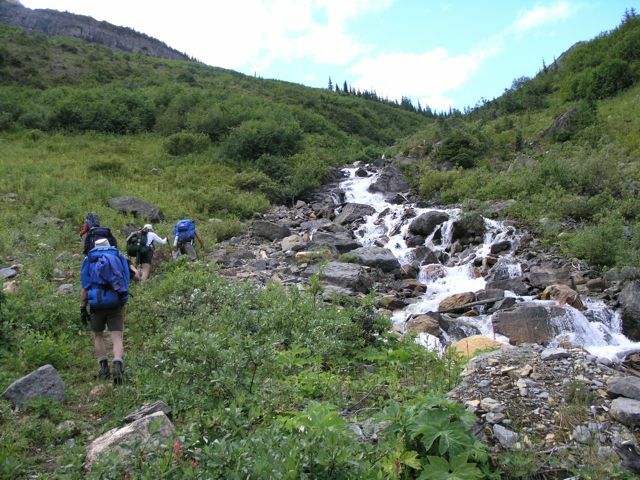 The hike in to the lodge is 5 km with an elevation gain of 2800. 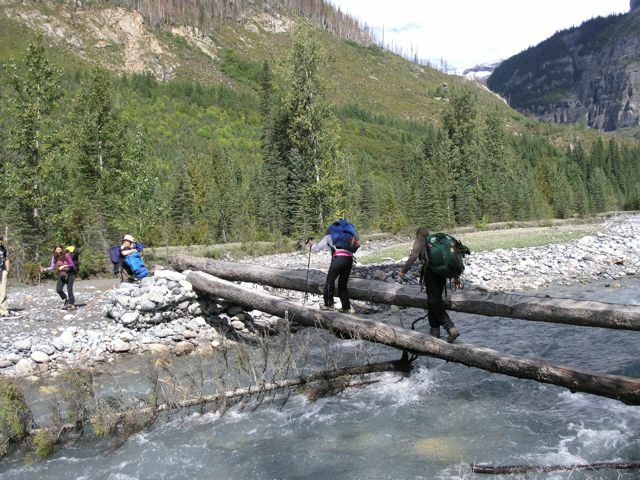 The trail crosses several creeks with only trees as bridges. Flags mark the trail where washouts are common and where rock beds are impossible to trail blaze. The route to the lodge switchbacks up a forested slope, crosses through a thick and moist old growth forest, meanders up and along several flower covered alpine meadows and traverses slide paths. Our party of 8 took just under four hours to reach the lodge from the trailhead. We carried in all our food for 3 days. 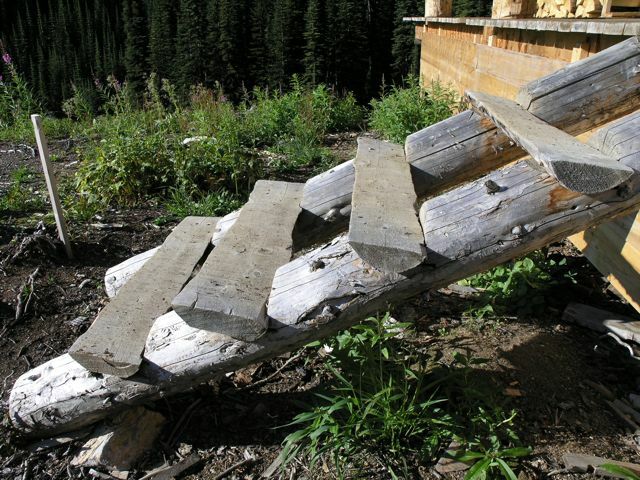 Featuring the simple charm of an alpine cabin, Icefall lodge is authentic. 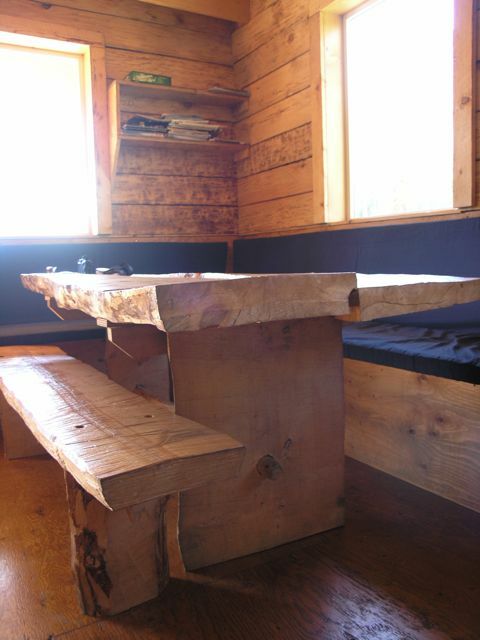 Everything from the dining room tables, picnic tables, to the bunk beds are all made on the spot with the wood of the surrounding forest. The main lodge is a three storied retreat featuring a drying room with wood stove, a second story dining room and a third story with 4 bedrooms with single or double beds. The kitchen features a full size propane stove, air fridge, sink and all the cooking utensils you need to cook a gourmet meal. There are two outhouses and a pee toilet in the lodge. A woodstove provides heat and hot water for cleaning, dishes and tea time. A sauna shack is heated with a wood stove which also heats water for showers, which consists of a watering pot hung from the ceiling with a caribiner! Surprisingly effective. Yoga mats and an ipod dock make for the most serene Yoga experience imaginable. A generator and battery bank provide full power to the lodge and water is pumped up from nearby Icefall creek. From our celebratory snack of oysters and wine, to AM Yoga, to midnight stargazing, the rugged helipad was our favorite place to just hang out! 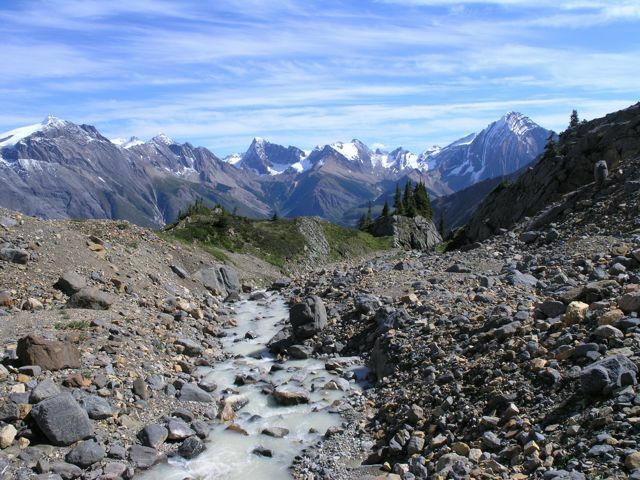 From the time you leave the highway you are already surrounded by the world class beauty of the rugged Rocky Mountains and with every foot closer to Icefall Lodge the view becomes more spectacular. Every step on the trail is a step up with access to an entirely new vista that was better than the one before. Keep your camera on at all times because the ‘perfect shots’ are endless. Being at eye level with some of the highest peaks in the Canadian Rocky mountains means that at every turn you feel compelled to take another shot, and they all turn out! The four hour hike-in is steady climb that keeps the heart rate elevated even at a modest pace. There is no better glute workout on the planet than climbing mountains. After a day on the trails nothing feels better than sweating out every last toxin in your body with a dry sauna. You will feel like a million bucks and sleep like a baby. 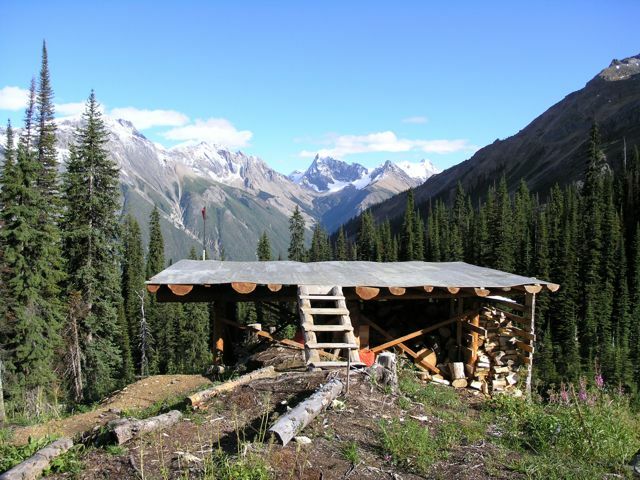 Location: Rocky Mountains in British Columbia Canada, Trailhead access is 2 hours drive from Golden British Columbia, with the last 22 kilometers on decommissioned back country roads. The lodge sits right at the BC/Alberta border. 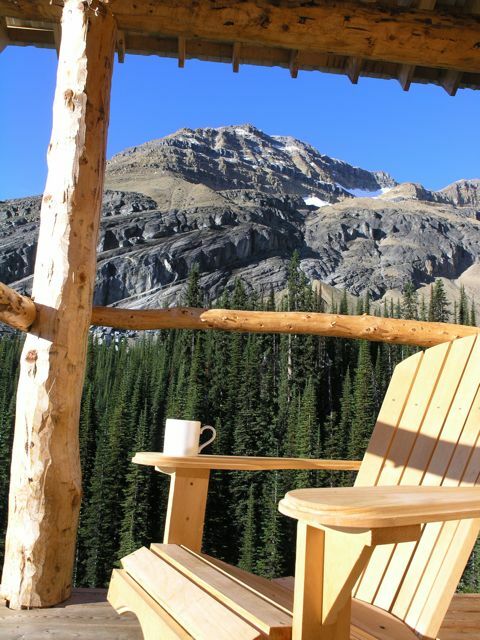 How about that view for morning coffee?